INMAN, HENRY (Oct. 28, 1801-Jan. 17, 1846), portrait and genre painter, was born at Utica, N.Y., the son of William and Sarah Inman. His father, born in England, 1762, came to American 1792, settled at Whitestown, near Utica, where he had a brewery and speculated in real estate. In 1812 he moved to New York City and became a merchant, but, meeting with reverses, went to Leyden, Lewis County, N. Y., where he died in 1843. His wife, born in 1773, died in 1829, bore four sons, three of whom made their mark in the world -William, the eldest, a naval officer who rose to the rank of commodore; Henry, the artist; and John [q.v. ], who was editor of the New York Mirror, the Commercial Advertiser, and the Columbian Lady's and Gentleman's Magazine. Henry as a boy in Utica had received some elementary instruction in drawing, and soon after the family moved to New York City he was preparing to enter the United States Military Academy at West Point, to which he had received an appointment, but at that time he chanced to meet John Wesley Jarvis, the portrait painter, who, being struck by the boy's promise as a draftsman, offered to take him on as a pupil. The result was that the West Point project was abandoned and Henry was bound as an apprentice to Jarvis for a term of seven years. The experience thus gained gave the young man an unusually good training in art. He was soon allowed to do some of the work on his master's canvases. With Jarvis he traveled far and wide, wherever there were portraits to be painted - to Boston, Philadelphia, Baltimore, and New Orleans. The apprentice, beginning by putting in the drapery and background, shortly began to paint portraits on his own account. At the age of twenty-two, his probationary period being over, Inman took a studio in Vesey Street, New York, and there began his career as a painter of portraits, miniatures, and genre pieces. The early years were prosperous and happy; but later there were sharp fluctuations of favor and neglect. Many eminent sitters came to him. Few American portraitists since Stuart have to their credit a more imposing list of distinguished patrons. At the top tide of Inman's vogue he was earning about $9,000 a year, at that period a handsome income. He commanded good prices and would make no reductions. Once when he had painted a group for a rich client, who paid the fee of $500 with some reluctance, he requested his customer to return the picture, and then he "cut off all the legs and sent it back with $200." In 1826 Inman was elected vice-president of the newly established National Academy of Design, of which he was one of the founders. He served in this office from 1826 to 1830, and again from 1838 to 1844. In 1832 he married Jane Riker O'Brien, and moved to Philadelphia, where he became a director of the Pennsylvania Academy and was associated with Col. C. G. Childs in a lithographic business. His home until 1835 was at Mount Holly, N. J., near Philadelphia, where he bought a country house in pleasant surroundings. He was fond of the country, liked to paint landscapes when he had the time, and complained because his patrons would buy nothing but portraits. He had a taste for natural history, Buffon being one of his favorite authors. After 1835 he returned to New York. For several years thereafter he was kept busy, but about 1830 [sic] the tide turned against him, and to add to his troubles the asthma, from which he had suffered periodically for years, became more severe, and he was deeply depressed. In 1844, he was commissioned by three generous friends -- James Lenox, Edward L. Carey, and Henry Reed -- to go to England for the purpose of painting the portraits of Wordsworth, Macaulay, and Dr. Chalmers. This proved a fortunate venture, and for a time resulted in Inman's improved health, renewed courage, and freedom from economic care. He had a very happy sojourn at Rydal Mount as the guest of Wordsworth whose portrait, now belonging to the University of Pennsylvania, was notably successful. Wordsworth spoke of him as the most decided man of genius he had ever seen from America, (Dunn, post p. 250). Inman's daughter Mary, who accompanied him on this trip, won all hearts by her beauty and gracious manners. While at Rydal, Inman made some landscape studies, including a view of Rydall Falls, and he made a drawing of the poet's house and garden from which later he painted a picture, now at the University of Pennsylvania, in which he introduced two small figures, one of Wordsworth and the other of himself. Going up from the Lake District to London, he was received with open arms by Leslie, Maclise, Mulready, and Stanfield, and his portraits of Macaulay and Chalmers were considered among his best. He also painted the portrait of Lord Chancellor Cottenham. He was urged to remain in London, but domestic duties and the precarious state of his health obliged him to return to New York in 1845. He then began the execution of a commission from Congress to furnish a series of historical paintings for the Capitol at Washington; and he was at work on the first of these, depicting the cabin of Daniel Boone in the wilds of Kentucky, when he died of heart disease at the age of forty-five. An important memorial exhibition of 126 of his works was held soon after his death in New York. It contained many of his best pictures. 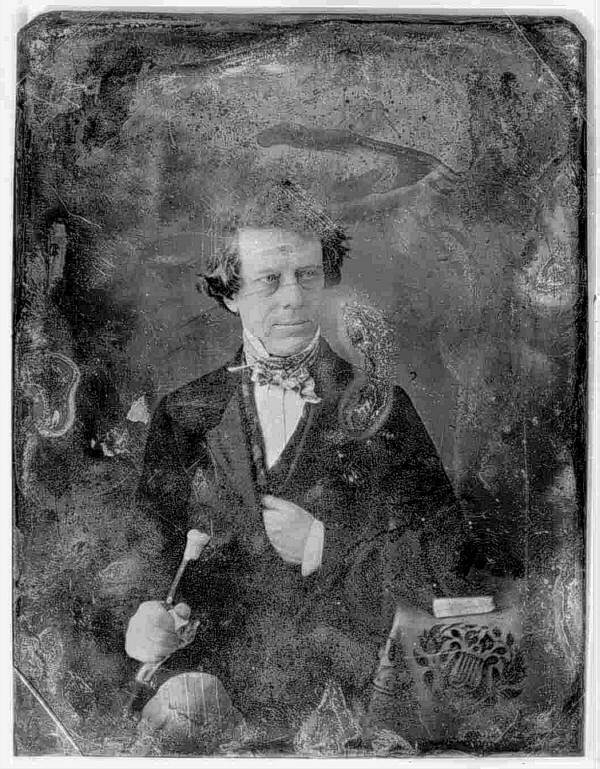 Among his sitters were Chief Justice Marshall, President Van Buren, William H. Seward, DeWitt Clinton, John James Audubon, Nathaniel Hawthorne, Fitz-Greene Halleck, Charles Fenno Hoffman, George P. Morris, Peggy O'Neill Eaton, Clara Barton, and Mrs. Elizabeth Oakes Smith, advocate of woman's rights. He also painted portraits of Lafayette and William Penn. His genre pictures and landscapes were popular. "Mumble-the-Peg" (in the Pennsylvania Academy) was engraved for The Gift for 1844. "The Boyhood of Washington" was based upon episodes recounted by Sparks in his biography. Of other works of this nature may be mentioned "Picnic in the Catskills" (Brooklyn Museum), "The Young Fisherman" (Metropolitan Museum), "Rip Van Winkle's Awakening," and the "Bride of Lammermoor." His "View of Rydal Water" (Brooklyn Museum) was painted at the suggestion of Wordsworth, who was with him while he made the sketch. His last painting, "An October afternoon," a landscape with figures, shows a rustic schoolhouse on the edge of a wood, with children at play. Inman's work was facile and exact in drawing, and it was often likened to that of Sir Thomas Lawrence. He was unequal, however, and at times meretricious. Isham calls him competent but commonplace, and finds "more likeness than character" in his heads. As a man Inman was likable and socially gifted. He was a good talker, wrote a little in prose and verse, and could hold up his end of an argument. His likeness shows him to have been a rugged person, with a thick wavy mane of hair, keen serious eyes, a large mouth, strong nose, broad brow, and determined jaw. He left five children, one of whom was Henry Inman, 1837-1899 [q.v.]. • He had a residence in 1840 in New York, New York Co., New York, USA. 995 Walker St.
• He had a residence in 1841 in New York, New York Co., New York, USA. 995 44 Vesey St.
• He had a residence in 1842 in New York, New York Co., New York, USA. 995 32 Warren St.
• He had a residence in 1843 in New York, New York Co., New York, USA. 995 489 Greenwich St.